I felt like I’d already got my money’s worth with all the amazing acts I’d seen on the free to see pop up stages, so by the time it came to go into the arena I was absolutely buzzing with excitement. At this stage in the day my phone decided it would pick up no data connection, so I had to use my wife’s phone to tweet everyone, as I knew their enjoyment relied on knowing what I was up to. The first of the main stage acts was Martina McBride, but I missed all but 4 songs as I was still in Town Square listening to Hannah Jane Lewis. Of the 4 songs I did catch the sound seemed to be off and her vocals struggled to be heard over the instruments. I’m sorry to say I wasn’t all that impressed, and wondered if I had heard a different singer to the one praised by fans who saw the same performance. It just didn’t wow me in any way and she didn’t seem like a performer with a career like Martina has had. Dierks Bentley took to the stage next and he blew the roof off the place. 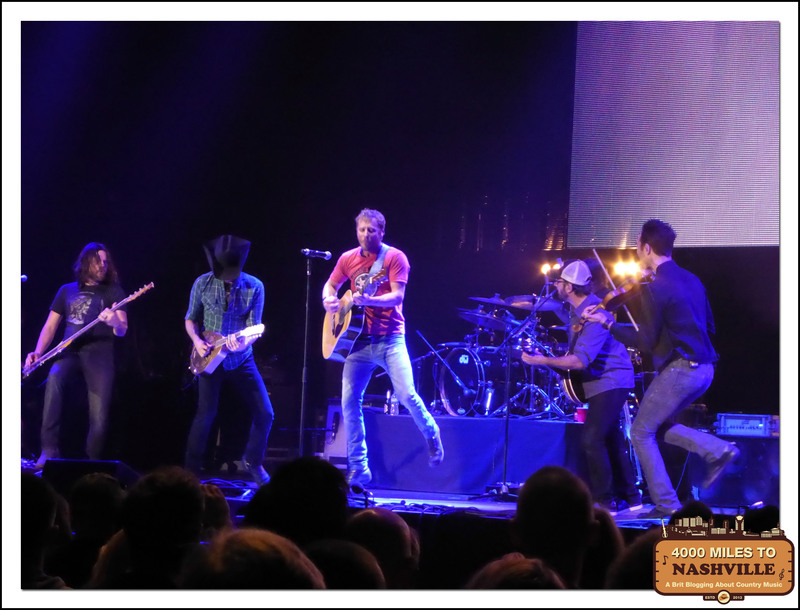 A party atmosphere took over the O2 Arena as Dierks and his band played their socks off. I’d listened to his new album quite a lot leading up to the gig, so was very familiar with tracks played from it. I especially liked I Hold On, his current single and a cracking song. Dierks was very humble and seemed genuinely thrilled to be performing, and gave us many stand out memories, including an almost Jimi Hendrix guitar smashing moment. He made one woman’s dream come true when he pulled her on stage, slung his guitar round her neck and pout her centre stage while he chugged back on a beer! I wasn’t familiar with some of his older material, but it didn’t matter, as he played with so much passion and energy that I challenge anyone to say they didn’t enjoy his set and come out a Dierks Bentley fan, or even more of one. Third on stage on Saturday night was arguably the coup of the whole weekend, as the Dixie Chicks came out to rapturous applause from the crowd. 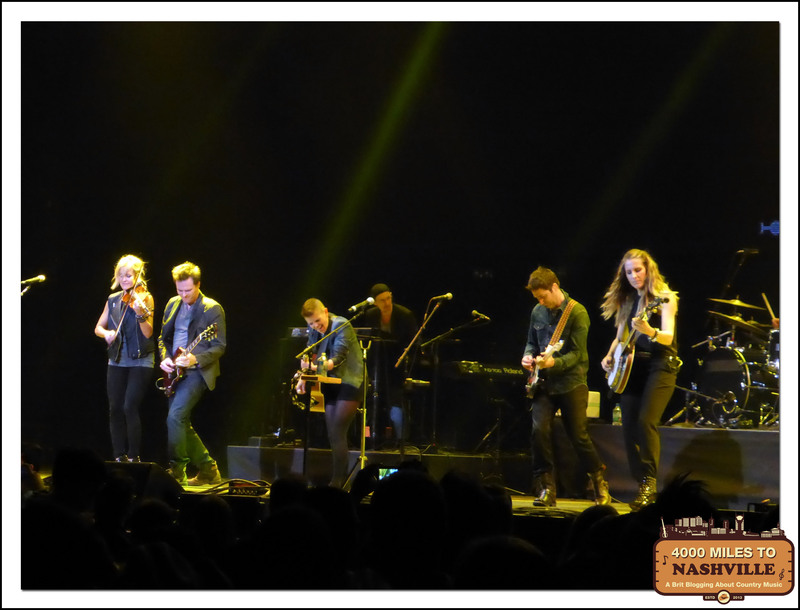 Their appearance at Country 2 Country 2014 was one of the last shows on their first tour since 2007, and this seemed to be the true headline band of the night for a certain portion of the crowd. So, how were they? Natalie was fierce and full of passion, while Martie and Emily were serene in their musical brilliance. They played every song anyone could want, that is apart from Travelling Soldiers that two fans near me requested between every song! They even played a cover of Wrecking Ball. Yes, that Wrecking Ball, the one made (in)famous by Miley Cyrus, who was perhaps the influence for Natalie’s almost military style haircut. Me personally, the highlight was Not Ready To Play Nice, which may be a predictable choice, but there’s no denying it’s quality and played live it sent tingles down my spine. Natalie didn’t talk that much, though she did have us all sing happy birthday to her son Slade. This did mean we got more songs which nobody was going to complain about, and after they’d finished quite a few people upped and left. They were every bit as good as legend had me believe, this being my first experience of Dixie Chicks live, but hopefully not my last. A live show from the Dixie Chicks is a rare thing, but to leave before Zac Brown Band was a mistake, a really big mistake. Listening to their albums I’d been of the opinion they would be pretty good, but maybe not the best of the night. They started off solidly, and true to my assessment, but then all of a sudden they started playing what sounded like the intro to Enter Sandman by Metallica, and it was! As covers go this was one of the very best I have ever seen live, and from that point on the performance took off. 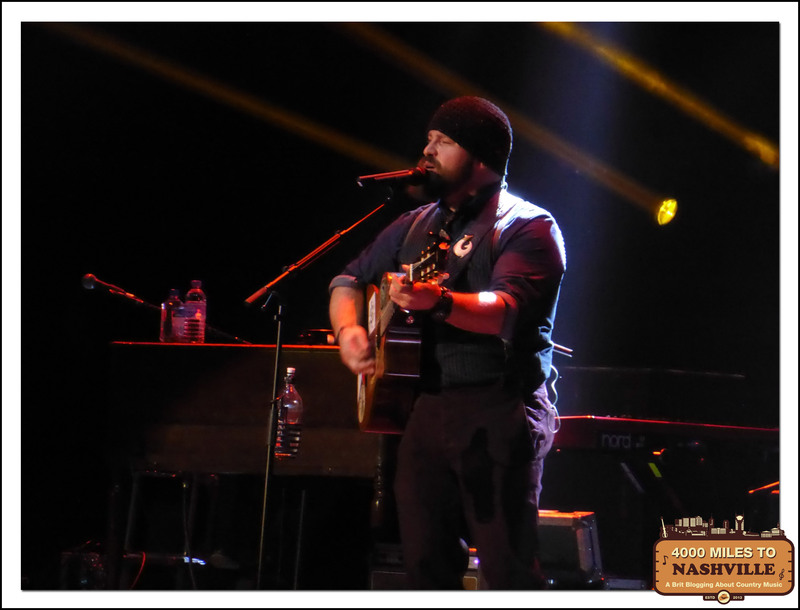 The eclectic mix up of musical influences and genres that Zac Brown Band bring to their live shows makes for an incredibly entertaining show as they played with equal parts ferocity, passion and unquestionable skill. Zac himself looks like he very successfully wrestles bears in his spare time, but has the voice of an angel, a very manly one. He plays his guitar with such vigour that it’s a whisker away from being a thrashing, but again, with such magical results. At one point Zac, whilst still singing, walked around the arena slapping hands with delighted fans. I myself got to exchange sweat with the the big man, but when he got to my wife he stopped, and serenaded to her. Hey, what am I going to do, it’s Zac Brown! 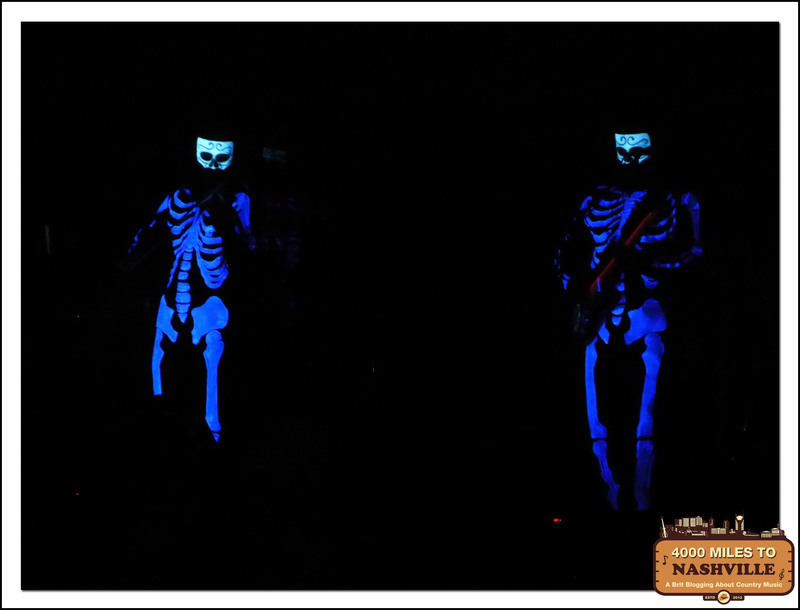 Their encore was a sight to behold as they came out in boiler suits, in the dark, which had been painted to have them show up as luminous skeletons. In these startling outfits they performed the title track from the latest album Uncaged, and then finished the show with The Devil Went Down to Georgia, which was a perfect end to the night and a fitting way to make use of their superb fiddler. Zac Brown Band far exceeded my expectations and delivered a performance truly fitting of the headline act. 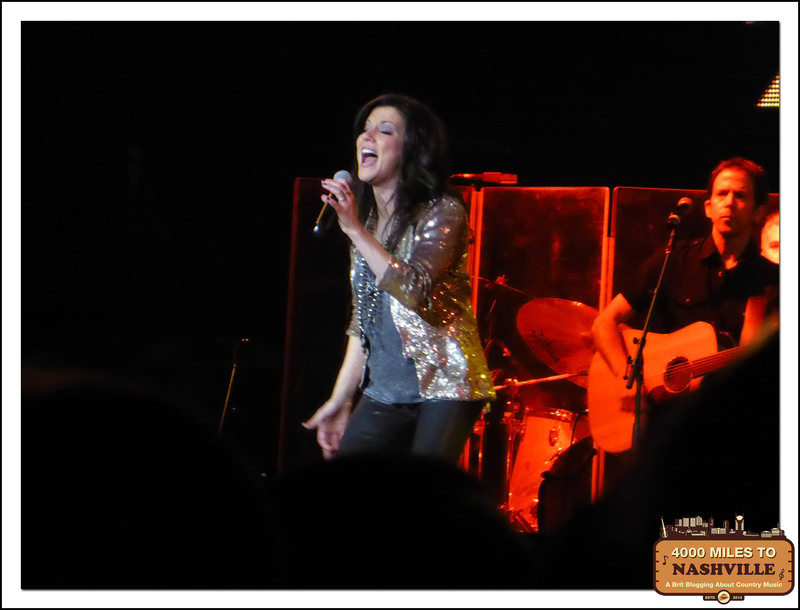 Night one of Country 2 Country was the perfect mix of artists, and even though I wasn’t struck with Martina McBride, I recognise her place on the bill. If I had to pushed to name a stand out act I think I’d say Zac Brown Band, with Dierks Bentley very close behind. It was great to see the Dixie Chicks but maybe it was a little too much about Natalie, or maybe that was just where my attention was focused. I went home a very happy country music fan, how could day 2 live up to this? Credit to my buddy @FuseMP for the photos – his camera is much better than mine in low light.